Cartridges of 30mm calibre are a relatively recent development, only entering service during the Second World War. Since then, they have become increasingly important in aircraft, anti-aircraft and armoured vehicle guns, and now probably represent the nearest to an international "standard calibre" for automatic cannon. This article focuses on cartridges which have seen service (however limited), although there is a note at the end about experimental rounds. As with all cannon calibres, collectors need to be aware of their national legal limitations on collecting such ammunition, most especially since most live service projectiles contain incendiary, tracer and/or high-explosive elements. These have generally been rendered inert before reaching the collectors' market, but it is important to check this. This powerful round was developed by Rheinmetall-Borsig of Gemany in the mid-1930s, for use in their heavy magazine-fed MG 101 cannon (later redesignated MK 101). A private venture, this saw little use until it was fitted to the Hs 129 "tankbuster" plane during WW2. This demonstrated the usefulness of a powerful cannon and it was succeeded by the smaller, lighter, faster-firing and belt-fed MK 103 gun firing (almost) the same ammunition. The MK 103 was used in the AA role in addition to various aircraft installations. One important difference between the two guns was that the MK 101 used percussion-primed ammunition, the MK 103 electric, so they were not interchangeable. A variety of different HE and AP loadings was developed but the best known are probably the Minengeschoss HEI for aerial combat, and the tungsten-cored Hartkernmunition for anti-tank use. This is a common round, readily available. The round shown on the left has a Minengeschoss Ausf.A shell. Another Rheinmetall-Borsig development, this first emerged in late WW2 and was only ever used in the MK 108 cannon. This was a compact, light and fast-firing aircraft gun, most famously installed in the Me 262 jet fighter. The low-velocity ammunition was almost exclusively loaded with Minengeschoss HEI shells (originally the blunt-nosed Ausf.1 type and later the streamlined Ausf.3) and was principally of value in the anti-bomber role. This is also easy for collectors to find. The round shown on the left has the more streamlined Minengeschoss Ausf.C shell. This was developed in mid-WW2 for the 30mm Type 2 aircraft gun of the Imperial Japanese Navy. Like the MK 108, this was intended as a bigger version of the 20mm Oerlikon-pattern guns, but it saw very little use and was never formally adopted. The cartridge case is very similar to the 30x90RB but that appears to be a coincidence rather than a copy. The Japanese gun was different in layout to the MK 108, and the ammunition used much lighter projectiles, fired at a higher muzzle velocity. A late-war cartridge for the Imperial Japanese Army's Browning-type Ho-155 aircraft gun, which only had time to see very limited service (although it was intended to take a major role had the war continued). The third of the WW2 Japanese trio of 30mm aircraft gun rounds, this time for the Navy's 30mm Type 5 cannon. Like the Army's Ho-155, this emerged so late in the war that it saw hardly any service. All three of these Japanese cartridges are extremely rare and the collector is unlikely to find any of them on a bargain stall – or indeed, for sale at any price. Thanks are due to Cliff Carlisle for providing the photos of them. All of the guns and ammunition described so far went out of use with the end of World War 2. Attention now switches to postwar developments. This was developed for the first generation of British Aden aircraft revolver cannon, known as the "low velocity" type. It bears a remarkably close resemblance to the 30x85B cartridge being developed at the end of WW2 for the Mauser MG 213C/30 cannon, which is hardly surprising since the gun and ammunition were copied from it. The 30x86B saw service in the mid-1950s before being replaced by the 30x113B. It isn't too difficult to find at ECRA meetings, but isn't cheap. The French also copied the Mauser MG 213C but they chose to lengthen the case to 97mm for the DEFA 540 series cannon. Much harder to find than the 30x86B. At around the end of the 1950s, both the 30x86B and the 30x97B were eventually replaced by the 30x113B, the subject of an Anglo-French agreement to standardise cartridge dimensions. Unfortunately this neglected to specify other aspects of performance, such as the pressure curve, electrical impulse for primer actuation, or belt link characteristics, so ammunition for the Aden (Mk 4) and DEFA (550 series) is not generally interchangeable. A more obvious difference is that the DEFA (later GIAT, now Nexter) ammunition is steel-cased, Aden rounds almost invariably brass-cased. These rounds are easy for collectors to find, in a wide variety of loadings. Rather less easy (at least in Europe, so far) is a later version of this cartridge, developed in the USA for the M230 Chain Gun (as used on the Apache helicopter). This is designated the LW series (for lightweight) as it uses a light-alloy case. The 30x113B is also used in the externally-powered Nexter 30M781 gun fitted to the European Tiger helicopter. 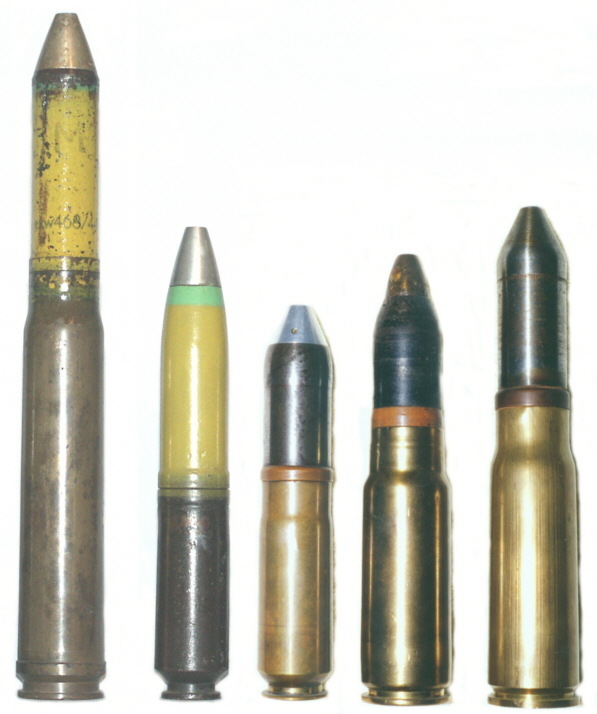 One point concerning the 30x86B, 30x97B and 30x113B is that they all have the same overall cartridge length of 199mm so the guns required only minor modifications to take the later cartridges. The cases were lengthened to increase the propellant capacity in order to boost the muzzle velocity at the expense of shell weight, to improve their hit probability in aerial combat. The projectiles (or, at least, that part of them which is visible above the driving band) have reduced in length accordingly. A cartridge only used in the Nudelman-Richter NR-30. This was the standard Soviet aircraft cannon from the mid-1950s onwards and is still in Chinese service as the NORINCO 30mm Type 1. It is now fairly easy to find at ECRA meetings. This was developed in the late 1950s for the Soviet navy's NN-30 anti-aircraft gun (unusually, a revolver cannon), as fitted to the widely-used AK-230 mounting. A modified version of the gun was more recently adopted by the Romanians for their land-based twin AA cannon designated the A436 or Model 80. The cartridge was also chosen by Zastava of Yugoslavia for their M86/M89 armoured fighting vehicle guns which, it appears, are still featuring in Serbian developments. Like most of the former Soviet ammunition, it is a lot more available in European cartridge fairs than it used to be. This round has an unusual history, since it was first designed at the Czech Brno factory, then developed under German occupation for the MK 303 anti-aircraft gun. After the war, the Czechs decided to continue with its development and it emerged along with the M53 cannon. Now obsolete, some may still be in reserve, mainly in the countries of the former Yugoslavia. 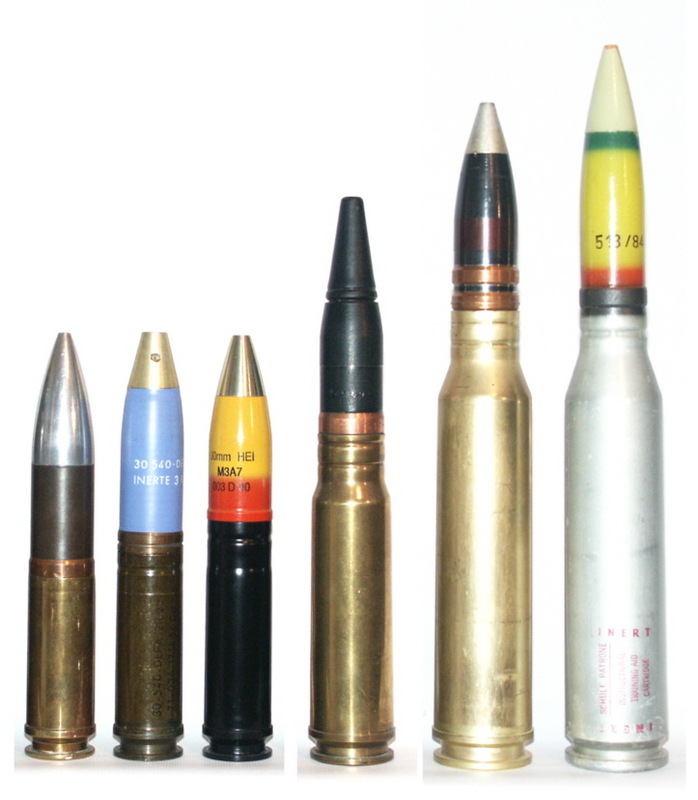 The cartridge is the biggest and most powerful of all of the service 30mm rounds, and is often misidentified as the 30x220 (it may also be designated 30x211). It is somewhat easier to find than it used to be, but is still uncommon. This was a Hispano-Suiza development from the 1950s, but has a connection to an earlier round as the base dimensions are exactly the same as the Hotchkiss 25x163, surely not a coincidence. The gun was originally known as the HS-831 but was renamed the Oerlikon KCB when the companies merged around 1970. It has exclusively been used in the anti-aircraft role, in both land-based and naval mountings. The cartridge cases were originally of brass but these are now rare, and steel cases are much more common. In the late 1960s the case design was adopted for the British Army's Rarden AFV cannon, but the material reverted to brass. Rarden and KCB ammunition are not qualified as interchangeable. The Rarden round shown above has an APDS projectile. Another cartridge with a complicated history, this was developed by Oerlikon in the 1950/60s for their 304 RK aircraft revolver cannon, later renamed the KCA. This only saw service in some versions of the SAAB Viggen fighter, which is no longer in use, although it was also offered in the Hughes Model 34 gunpod. The KCA cartridge shown above is a drill round. In the late 1960s the cartridge design was adopted for the American GAU-8/A 7-barrel rotary cannon, as fitted to the A-10 "tankbuster" plane and subsequently to the Goalkeeper naval CIWS. However, this differed from the KCA ammunition in three respects: the case material was changed from steel to light alloy, the priming from electric to percussion, and the driving bands from metal to plastic; as a result, the rounds are not interchangeable. Later still the GAU-8/A cartridge was adopted for the Mauser MK 30F cannon which is in wide use as an AA gun, and finally for the American Bushmaster II Chain Gun (renamed in its current, marinised, version as the MK44). The most recent development by some manufacturers is a reversion to steel (but still percussion-primed) cases for the loadings specifically intended for AFV cannon, with the Mauser (now Rheinmetall) MK 30-2 being designed for these. The 30x173 is now the most common Western cannon cartridge in this calibre, and is available in a wide variety of loadings, including APFSDS, from several different manufacturers. However, both the KCA and the latest AFV steel-cased rounds are hard for collectors to find, as is the GAU-8/A's notorious PGU-14/B API with a depleted uranium core (distinguished by a black and red projectile). 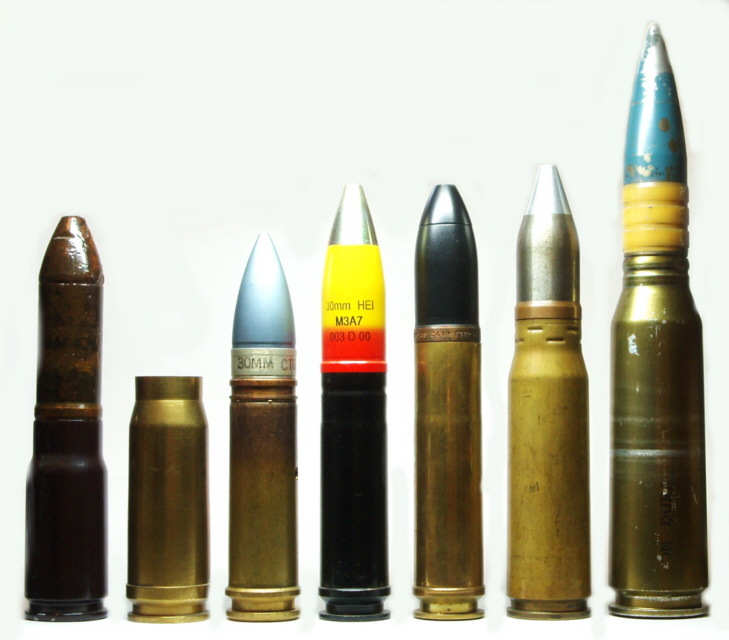 Most cartridges available are of the alloy-cased TP type, with blue projectiles. The cartridge shown above is the Missile Piercing Discarding Sabot for use with the Goalkeeper CIWS. Developed in the 1970s and originally known as the AO-18 cartridge, this was meant to be the USSR's attempt at a tri-service cannon cartridge to replace all other types. In a sense it has, since guns in this calibre now seem to be the only automatic cannon made in Russia. The weapons chambered for this round have included the twin-barrel GSh-30 (Su-25 aircraft), single-barrel GSh-301 (current fighter gun), six barrel rotary GSh-6-30 (variants used in naval AA mountings and in the MiG-27), 2A38 (twin-barrel army AA), and single-barrel 2A42 and 2A72 (army AFV and helicopter guns). However, the three services developed their own loadings for the ammunition which do not appear to be interchangeable. 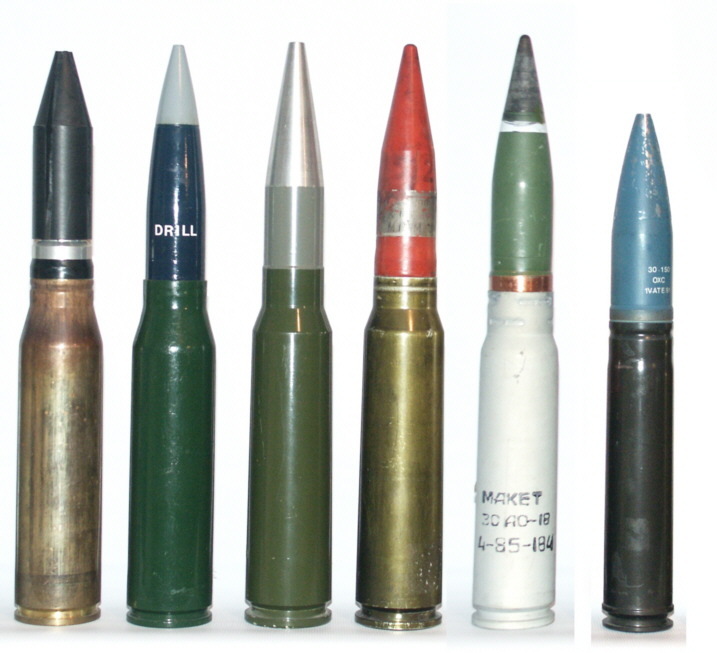 The army ones differ in having percussion priming, and while the navy and air forces round share electric priming, the projectiles vary in overall length due to different fuzes. Collectors can now find these rounds quite easily, in a variety of loadings. One distinctive type is the HE-T, which differs from HE rounds in having a projectile with a "waisted" shape. The round shown above is a naval HEI, as indicated by the green shell colouring. This is the most recent introduction in 30mm calibre, developed from the 1980s for the Nexter 30M791 aircraft revolver cannon. This gun is (so far) only installed on the new Dassault Rafale fighter, which entered service a few years ago. It resembles a lengthened 30x113B round, although the base dimensions are slightly different. The only service type appears to be a base-fuzed SAPHEI, with TP (as shown) or inert drill ones being reasonably commonly available. As is usually the case, for every round which reaches service several have been developed to varying degrees before being cancelled. Described below are a few experimental rounds which a collector might stand some chance (however slim) of finding. In WW2, BMARC (the British Hispano-Suiza subsidiary) developed a scaled-up Hispano cannon chambered for a 30x170 cartridge which is virtually identical to the postwar HS 831 round (not a coincidence, I think). This is very rare, so if you find a brass case of this size, check the headstamp! Some other 30mm rounds were also developed in Germany in WW2, most notably the (also very rare) 30x91 for Mauser's MK 212 rival to the MK 108. After WW2 Hispano went on to develop the 30x136 for the HS Type 825 aircraft cannon which almost made it into service; cartridges do occasionally come up on the collectors' market, but they are uncommon and expensive. Most of the 30x136 found are rimless, but a few are belted. In the 1950s the USA produced two 30mm rounds for revolver cannon: the 30x126B T239 round was just an extended version of the usual Aden/DEFA cartridge (again, keeping the 199mm overall length) for the T182 revolver, and this is quite easily found. Much rarer is the extraordinary 30x120RB for the front-loading T168 revolver, in which the base of the case tapers down to a tiny rim just 17mm in diameter. There are two later US experimentals which are not uncommon. One is the 30x100B WECOM (after the Army's Weapons Command) for the XM140 gun intended for the abortive Cheyenne attack helicopter. The XM140 was dropped in favour of the M230 Chain Gun in 30x113B. The other is the Philco-Ford 30x164 developed for a rival to the GAU-8/A.